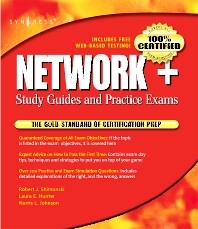 The Network+ Study Guide covers all the objectives on the CompTIA exam, including the features and functions of networking components, and ensuring that readers have the knowledge and skills needed to install, configure and troubleshoot basic networking hardware, protocols and services. It covers exam topics such as media and topologies, protocols and standards, network implementation, and network support, as well as new exam topics on technologies such as wireless networking and Ethernet. Network+ candidate is looking for a way to prove to potential employers that he has 9 months of networking experience. The Network+ certification does that and is now a requirement of many companies hiring technicians. Candidates are searching for low-cost yet comprehsenive study tools. Rob Shimonski (www.shimonski.com) is an experienced entrepreneur and an active participant in the business community. Rob is a best-selling author and editor with over 15 years experience developing, producing and distributing print media in the form of books, magazines and periodicals. To date, Rob has successfully created over 100 books that are currently in circulation. Rob has worked for countless companies to include CompTIA, Entrepreneur Magazine, Microsoft, McGraw Hill Education, Cisco, the National Security Agency and Digidesign. Rob has an extremely diverse background in the print media industry filling roles such as author, co-author, technical editor, copy editor and developmental editor. Since print media shifted to the digital domain, Rob has focused the past decade on developing all of the needed skills to produce professional audio and video media. An expert in Digital Audio Workstation (DAW) design and video production, Rob has created over 500 different media packages to include commercials for TV, online advertising clips, audio podcasts and much more. Rob started to train others while in the US Marine Corps. Since, Rob has held a NY State teaching certificate as well as multiple trainer roles in colleges and trade schools across the world. is a networking and security veteran with over 20 years' experience in military, corporate and educational environments.